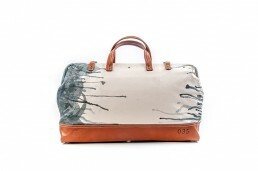 New York based Artist, Mark Fox, created this Gentlemen’s League bag in his famous layered watercolor technique. 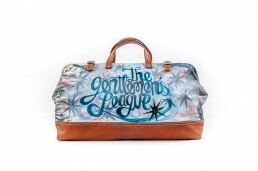 On the front, Mark shows The Gentlemen’s League written in his signature style font in varying layered shades of blue and white. On the back, a minimalistic watercolor in hues of blue, showing the beauty of the original canvas paired with the fragility of the drip of watercolor paint, Bag 035.